AMIE, short for Additive Manufacturing Integrated Energy, is a model for energy-efficient systems that link buildings, vehicles and the grid. Highlighting the current trend for smart living and the need to create a personal green space within a rapidly urbanised world, AMIE also showcases a new approach to energy use, storage and consumption. Flexible photovoltaic panels are integrated into the house roof, which work with a natural gas-powered generator located in the vehicle to supply energy for lighting and the central micro-kitchen. In addition to supplementing the vehicular energy source, the panels also charge the enclosure’s battery when the fixtures are not in use. 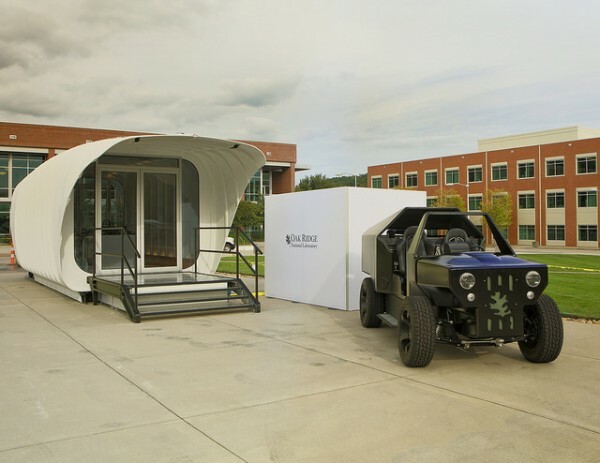 AMIE also showcases additive manufacturing’s rapid prototyping potential in architecture and vehicle design by building both the car and house using large-scale 3D printers. The 38x12x13-foot building was designed by architecture firm Skidmore, Owings, and Merrill (SOM) through the University of Tennessee-ORNL Governor’s Chair for Energy and Urbanism, and it was assembled by Clayton Homes, the nation’s largest builder of manufactured housing. 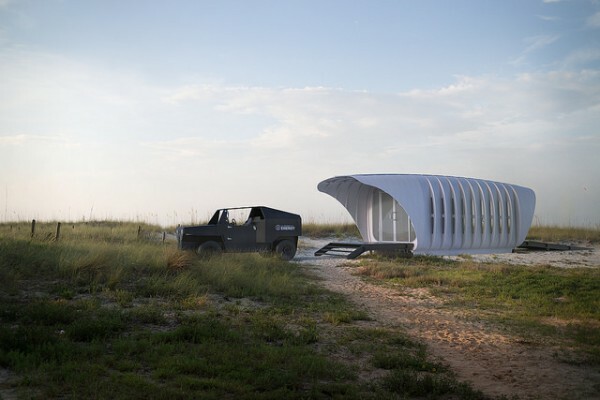 SOM hope that the project can show how similar developments can lead to zero-waste construction, reduced material consumption and the recycling and reprinting of buildings for new forms and uses.